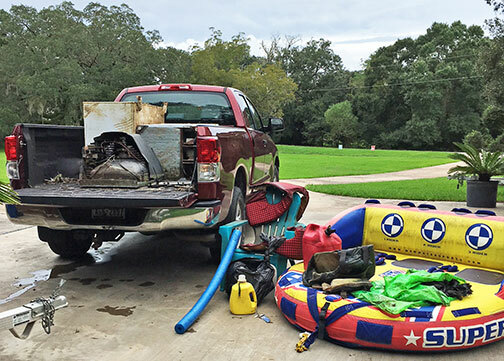 Despite canceling of the annual FOR river cleanup due to weather conditions on Sat Sep 29th, a few river residents residing near Sweeny, forged ahead and retrieved some big debris from their part of the river leftover from Hurricane Harvey’s visit. Thanks to Tom Ronayne, Clay Funk, Connie Funk and Son Funk for collecting and loading these items - two freezers (one was 3 miles from its door), a color TV, plastic stool, Adirondack chair, folding chair, gas can, three youth life jackets (thankfully without the youths), a mess of black plastic and miscellaneous floaters, bottles and jugs. Thanks from all of us downriver dwellers who won’t see the stuff floating by during the next high water event.